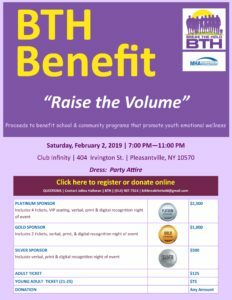 Please join us for our first annual BTH “Raise the Volume Benefit”. Let’s have some fun! Enjoy music, games and dancing. Together let’s raise awareness on the importance of youth mental health and remove the stigma associated with mental illness. Proceeds to benefit school and community programs that promote youth emotional wellness.